Market Yourself launch party! A chance to win $50! Hello friends! Today's the day! Market Yourself is out of pre-orders and is shipping out, right this minute. Tonight I'll be teaching a workshop on Right People. It's totally free, and it's at the fabulous Gather Here. Get the details here. Not in Boston? Tweet + win $50! To celebrate the launch of my book, my publisher is giving away a $50 gift certificate for any of their books. To win, all you have to do is tweet about the book, and use #marketyourself in your tweet, today. Shannon will pick a winner (randomly) from all tweets + announce it via Twitter tomorrow morning. In your tweet, you can ask me questions (I'll answer every one! ), you can talk about your favorite part, or you can share your own marketing struggles. 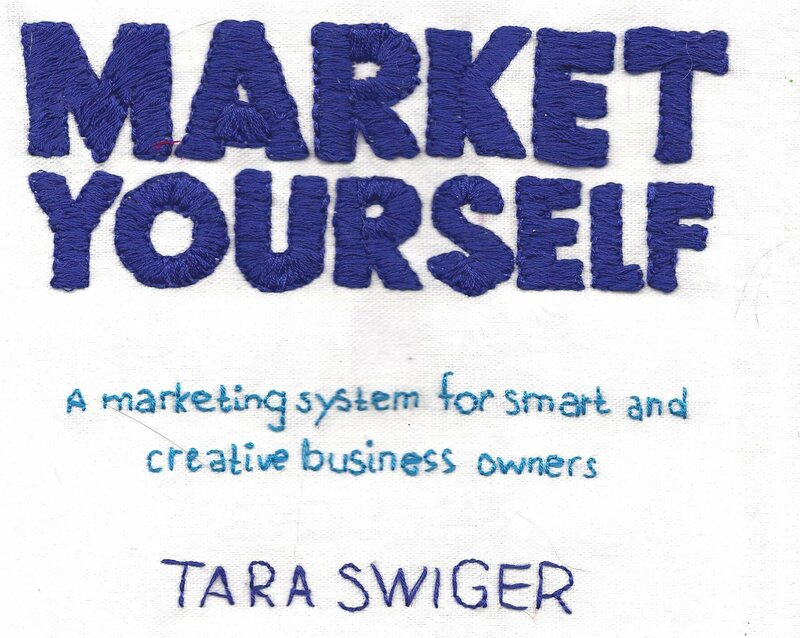 Reading Market Yourself by @TaraSwiger Based on how much I am using the Good Reader highlight function it must be good! The difference between the different versions. + a PDF of the entire book, emailed immediately after purchase. Print or Digital available anywhere else. Yep, you can buy the book from Amazon , but it won't include a PDF of the book. Why do I want a PDF? Because your business is always changing! There are a squillion worksheets in Market Yourself and while you're welcome to fill them all in on your print version, I want you to be able to come back in 6 months or a year and revisit the worksheets, and be able to look at all the questions with fresh eyes. The PDF allows you to print (and reprint!) the worksheeets as often as you need to. And if you buy the digital-only copy, a PDF lets you print out just what you want, so you can apply pen to worksheet. Ask them in the comments, or tweet them! 2 Comments on Market Yourself launch party! A chance to win $50! I’m on page 26… Wow, it’s really awesome how she is pulling out my old way of doing things and teaching me to look at my business in a fresh new way. A new mission statement has been born! Thank you Tara!